April has come with mild weather for the most part, and yielded some nice days on the water. We are hoping to see some warming water temps as a multiple inch rain event passed through on 4/14. The fishing has been good, and we have had some nice brown trout, walleye, and smallmouth finding the net. There are still openings in June-Sept. Call Evan at 570-647-7030 or Mike at 570-647-6069 to schedule a summer trip. Here are some of our successful anglers. 3/31/19 Steve with a slammer 20” brown. 3/31/19 Chris holding a nice brown trout. 4/5/19 Steve with a beauty brownie. 4/5/19 Ed with a fat Chain Pickerel. 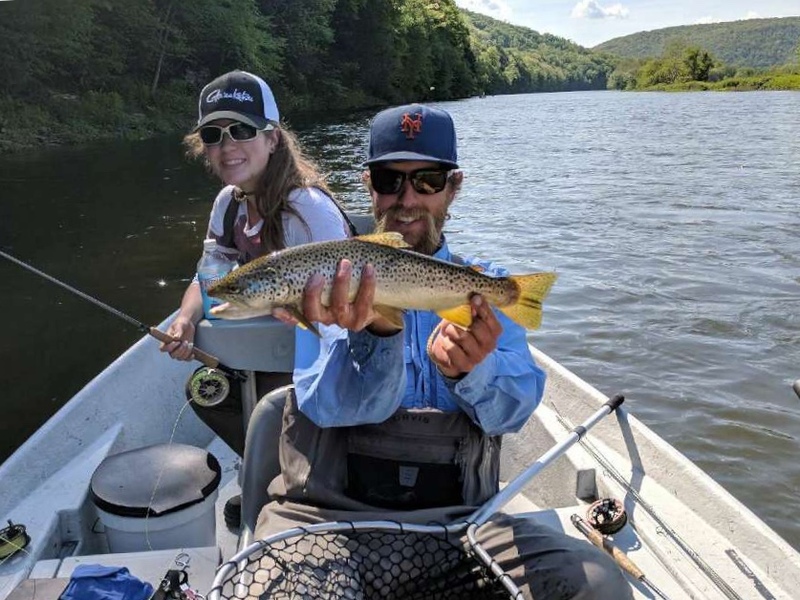 4/13/19 Guide Mike P. displays a slammer 20.5” brown trout caught by Roger S.
4/3/19 Lucas with his debut Delaware river brown trout. 4/9/19 Steve D. with a nice Rainbow trout. 4/9/19 Steve D. with a slender and beautiful 20” Brown trout. 4/9/19 Kyle T. with a beauty on the dry fly. 3/27/19 Len with a slammer 21” early season brown trout. 4/6/19 Gary M. slams a Smallmouth Bass. 4/12/19 Anthony with a healthy West Branch brown trout. 4/13/19 Brian G. enjoying the river in the A.M.
Fall fishing brings fantastic Trout, Walleye, and cold water Smallmouth bass fishing. Join us this fall for a peaceful river outing before Old man winter moves in on us. Here are some recent large trout brought into our nets! 22” Brown trout for Craig N.
22” rare Tiger trout brought to the net by Ron N.
We have had a very high water year this summer. We had very above average flows and a lot of rain throughout July and August. It was productive with fish on days that we were able to fish. A lot of trout, bass, and walleye were brought to the net this summer. These are photos of our successful anglers from this summer. Please email us at evan@sweetwaterguide.com or mike@sweetwaterguide.com to schedule a fall fishing trip. Julie with a nice smallmouth on a beautiful summer day. Robert with A beautiful 16” Smallmouth! One of Ralphs big brown trout of the day. Guide Evan with a nice 19” Brown trout. Mark with his first Delaware river walleye! Zach with a beautiful brown trout on his first float. Matty the “Walleye Whisperer” with a 22 incher. Mike with a slammer smallmouth on this rainy day. Spring fishing has been hot with fish but cold by day. Conditions have varied everyday as spring weather remains unstable. The Brown trout are hungry, Bass and Walleye have been hitting in slow deep water. Book a Spring trip today, call 570-224-4747 to reserve a date for a float trip. 3/31/18 Larry and Ed slam a pair of Brown trout on the last day of March. Larry hits a 19" Male Brown trout! 4/1/18 Another Brown trout double, caught by Andy and Mike. 4/2/18 Andy slams his PB Walleye at 26"
We've been passing time on the ice, we have had a lot of success with Perch and some Crappie, plenty of Pickerel and Large mouth bass on select days as well. We will continue to get the lines wet when we can. We are booking Spring fishing trips almost daily right now, so if you will like to reserve a date, please Call us at 570-224-4747 as soon as you know what date works for you. Here are some photos of from our last few ice fishing outings. A nice Perch from a local pond. Our buddy with a Pickerel on a tip up. A mixed bag kind of day. The beautiful sunset over the pond. This summer brought below average water temperatures, and above average water flow. These conditions provided great mixed bag fishing conditions for most of the summer. We boated Walleye and Bass almost everyday, with a few trout still finding their way to the net this summer. Check out these photos of this summer's successful anglers. Sara with a 17 1/2" Smallmouth! A beautiful 23" Walleye for Henry V.
Night time Brown trout on the surface. A nice smallmouth in a "WIFI hotspot"
A 20" Walleye for the little man. Matty with a nice Brown trout. Gary Jr. Displaying a gorgeous smallmouth bass! Trinity with a Walleye to start out the day. We have had a very busy Spring season. We have had phenomenal trout fishing on the West Branch and Upper Main Stem, and great Shad and Walleye fishing lower down on the Main Stem. Here are some photos from our successful anglers! The Reel Raconteur lands a slammer Walleye! The Reel Raconteur with a slammer 19" Brown trout. Guide Evan P with a 17" Smallmouth. 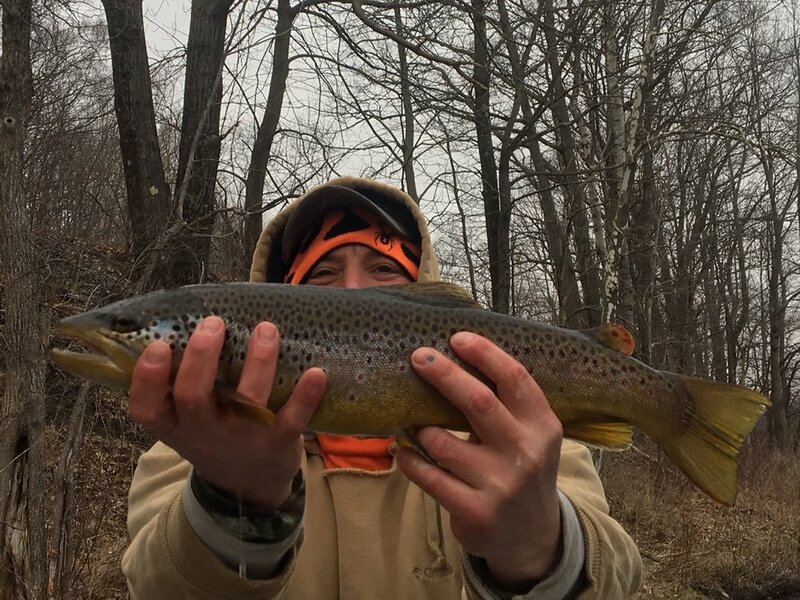 Dan B. with a hefty Brown trout. Double Shad with Joe and Bob! Bianca with a big Roe Shad! 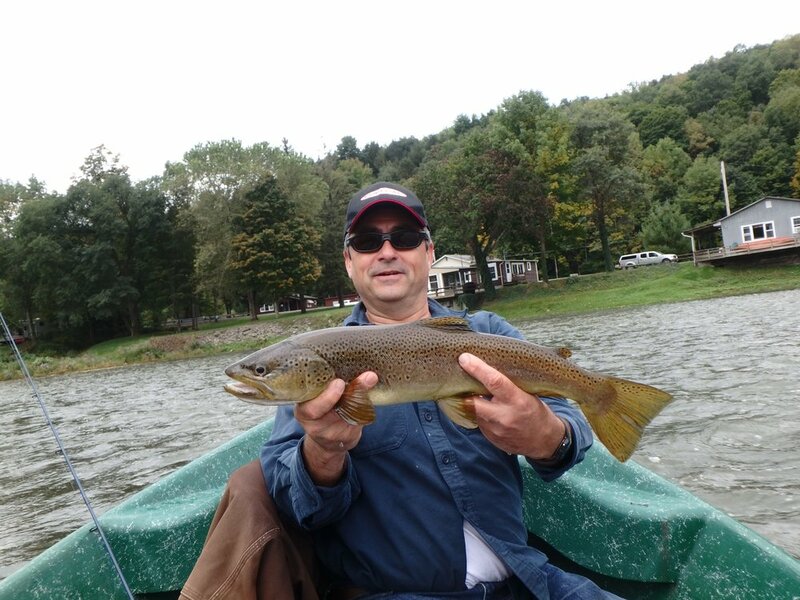 Bill R. with a nice Brown on a Dry Fly! Kyle T. with a Slammer Rainbow on the dry fly. Mike K. with a nice Shad. Mike K. with a good Smallmouth! 21" brown trout on a size 20 Blu Winged Olive. Brute of a Brown trout on this cold day! Beautiful spots on this Brown trout. 21" Brown trout on a rainy morning!! All the way from Long Island, boating trout on the West Branch. 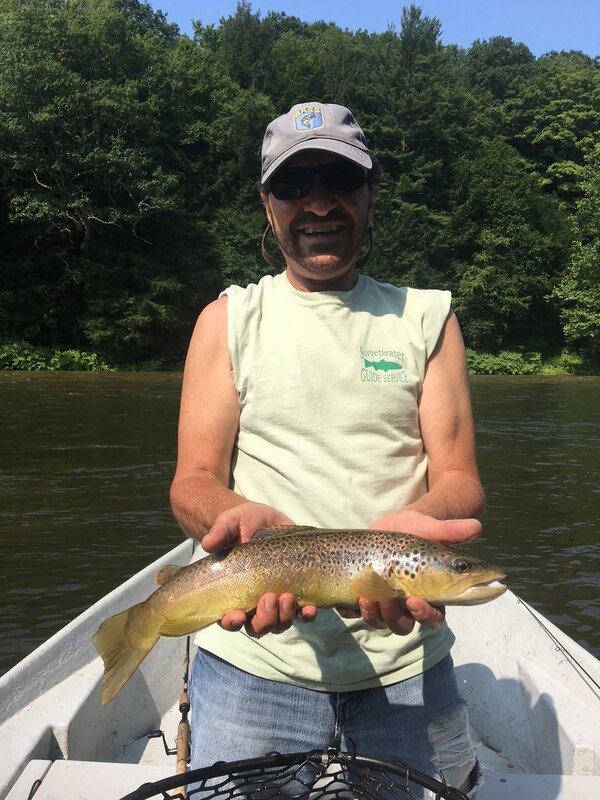 Jim K. with a 20" brown on the dry fly. Matty with the Queen of the pool! Post spawn 9lb 28" Walleye! Mike with a solid 20" Brown on a March Brown emerger. Joe with big Roe Shad!! Nice Roe Shad for a nice lady. Rainbow on the dry fly for Guide Evan P.
We have started our 2017 season off with the reservoirs at over 100% and spilling over the dams. We have Alewives in the rivers and fish are gorging and healthy. We have been hammering Brown trout on the West Branch, and are having solid mixed bag days on the Main stem. Join us for a float trip! Alewife from the West Branch. Scott with a beautiful Brown from the West Branch. Stan with a gorgeous Brownie! A 19" Brown and a 24" Sucker in the net! A hefty early season Brown. Mike Tyson got a hold of this Brown. Frank with a fatty Brown trout! Guide Mike P. launching the boat into the West Branch. 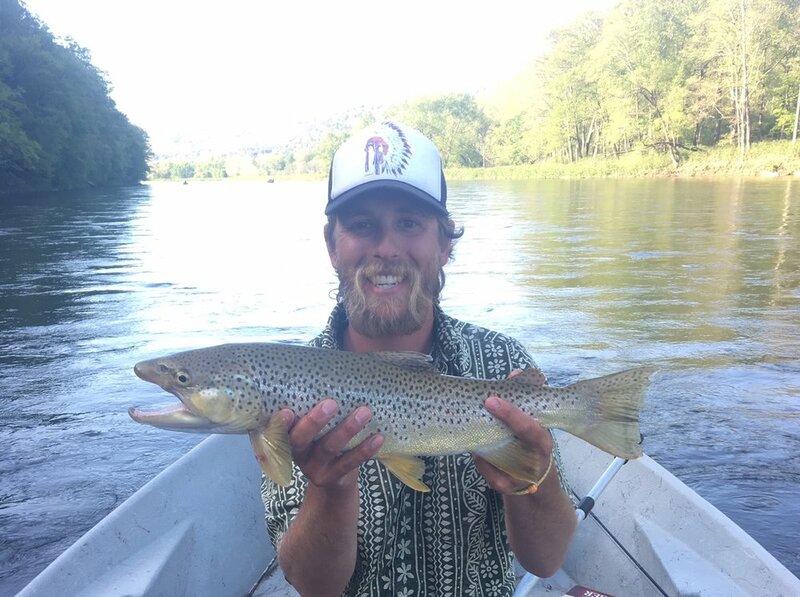 Guide Mike P. displaying a 20" Brown. Pete, on the board with a nice Brownie. The New Year is bringing to fruition Sweetwater Guide Service LLC. We are now a Limited Liability Corporation. We also plan on having a busier season than ever before! With trips already being scheduled for our 2017 fishing season, we encourage you to plan ahead and schedule your spring fishing trip today. We are currently in a hibernating winter pattern, fly tying, and refreshing gear for spring are on our daily agendas. We look forward to fishing with you this season! Think Spring! This summer was full of beautiful weather, great scenery and great fishing. Here are some photos from our successful anglers! Fall fishing is shaping up nicely with nice Rainbow trout, Brown trout, Bass and Walleye fattening up for winter. Schedule your trip today! Lots of Nice Smallmouth this summer! Brother and Sister getting the Double! A fun first day on the Delaware! A young Mets fan gets a nice Smallmouth! A nice 21" Smallmouth Bass for Rick L. and his son. Summer trout fishing remained consistently good. A nice Brown with red spots taken on a streamer. A 21" Brown trout for Guide Mike P.
Tony D. with a beautiful 21" brown from the west branch. 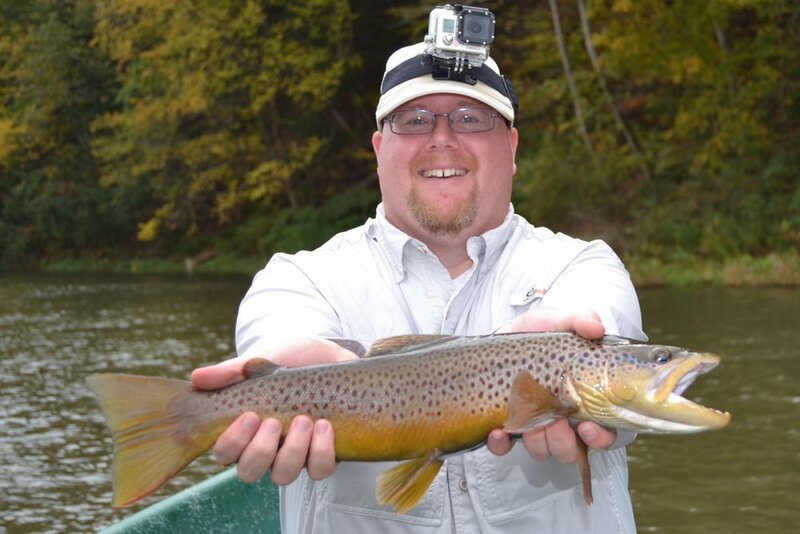 Tony D. with another nicely colored West Branch Brownie. Another nice Smallmouth on a cool late summer day. A nice rainbow for Guide Mike P.
09/12/16 A nice 17" smallmouth for Jody R.
09/19/16 Guide Mike P. with a 22" Brown in Lordville. Al and Scott trout hunting. Al with a nice Rainbow taken on a Nymph. A little Brownie for Bob L.
A Beaver swimming in the River. A nice Buck having a riverside snack. A 15" Smallmouth for Bob L.
The month of July has been a true summer month with hot days and some relatively cool nights. The Cannonsville Reservoir release has been sustained at around 500cfs and was recently risen to 700cfs. This cold water is providing nice cool water for the West Branch and very Upper Main stem. Down stream it is helping the lower main stem flows stay up so there are not as many shallow exposed places. The fishing for all species here has remained good, with the Smallmouth Bass fishing taking the cake with 60+ fish days on the regular. Here are some photos of our successful anglers from the end of June and into July. Please give us a call at 570-224-4747 to schedule a late July or August fishing trip. A day on the water is blissful and relaxing, come join us. 06/29/16 Healthy Smallmouth Bass out of the Delaware river. 06/29/16 First year Stripers have been caught occasionally. 250 miles from the ocean. 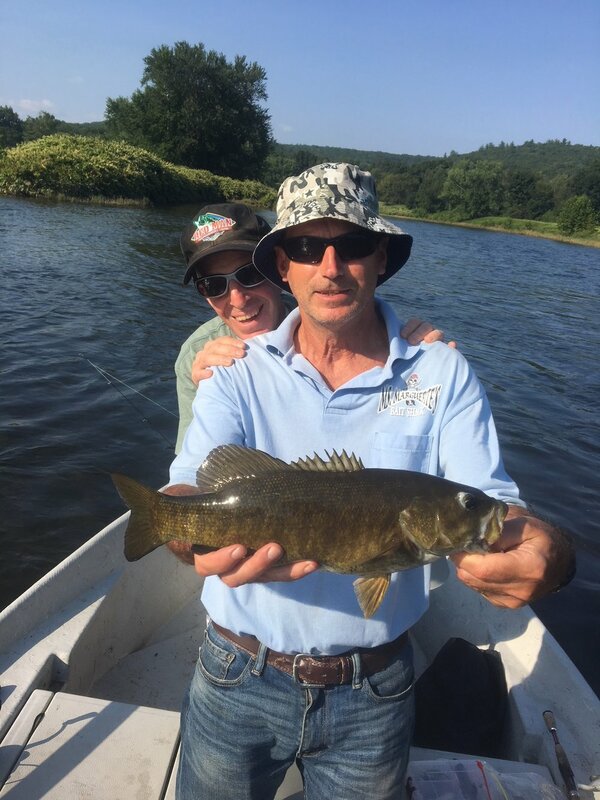 06/30/16 Kathy E. slamming a nice Smallmouth Bass! 06/30/16 Rick E. Holding up the Double! Lots of action! 07/15/16 A nice Walleye in the boat. 07/15/16 Ralph with a nice 17" Smallmouth bass! 07/19/16 Ricky L. fighting smallies on the fly rod. 07/19/16 RIcky L with his first Walleye ever! 07/19/16 Ricky L. With a sunset smallmouth. 07/21/16 Triple Smallmouth Bass. The action is bonkers. 07/22/16 Colby hittin Smallmouth all day long. 07/24/16 A nice 19" Walleye in the sun!